Shri Surya Kavach Stotra (श्रीसूर्यकवचस्तोत्रम्), crafted in Sanskrit, is a beautiful creation of Great Rishi Yadnyavalkya. ‘Kavach’ means – to give protection. 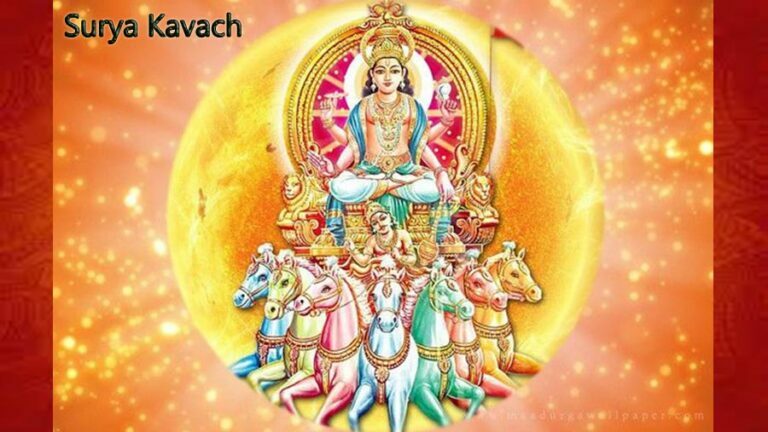 Surya Kavach is a Kavach of God Sun (God Surya). This Kavach protects us in all manners to give us good health and prosperity. A devotee has to recite this Kavach with complete faith and devotion to receive blessings from God Sun. Rishi Yadnyavalkya has said in the stotra that whosoever will recite this Kavach will become free from diseases. He will live long with happiness with properity.